Anyone who has owned a pet understands that animals can have complex emotional lives. They feel sorrow, guilt, joy, and anger – and now scientists believe many animals even have a sense of humor. While researchers haven't really studied giggling animals in the past, new studies hope to answer the question of whether or not animals can laugh. Dolphins are some of the most beloved animals on the planet, and it's not hard to see why. They're incredibly intelligent, and display emotional and intellectual skills that are unrivaled in the ocean. As for whether they use language, that's still up in the air; they certainly emit many different calls that can be interpreted as words or messages, but it's a difficult hypothesis to prove. Marine researchers in Sweden have observed some of the best evidence to date of dolphin laughter, and they believe it has an important role in socialization. When engaging in play-fighting, dolphins emit a specific noise that seems to indicate their intentions as non-threatening. This only occurs during playful interactions and never during actual fights, leading researchers to believe that this sort of dolphin "chuckle" is meant to signal the roughhousing is all in good fun. Keas are a playful species, even when they are alone, and scientists discovered that one of their calls has a unique emotional effect on the birds. They played a recording of a kea "laughing," and saw that it caused other keas to respond and begin playing on their own or with nearby birds. The great apes are humans' closest living relatives, and share a remarkable amount of similarities. 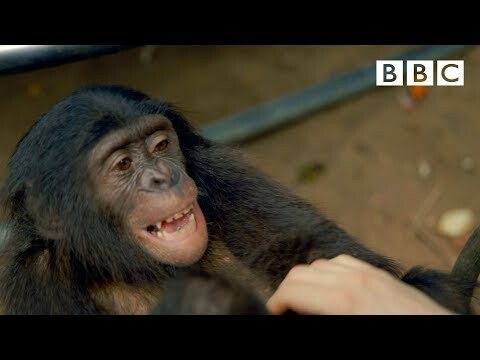 Just like people chimpanzees and bonobos are ticklish. When tickled in places like the armpit, neck, or feet, these apes break out into fits of shallow panting that is believed to be their form of laughter. Rats often get a bad reputation as pests, but science owes a lot to these little guys. They have been used in all sorts of experiments, including ones attempting to discover the origins of human laughter. Studies indicate rats may emit a sort of primitive laughter when engaging in social play or being tickled. These ultrasonic vocalizations are inaudible to human ears, but the rats get the message loud and clear. The researchers involved in the study believe the behavior is so similar to human laughter that the two likely result from the same mechanisms in the brain. This suggests that laughter has been around since the earliest days of mammals.